All Coronado Thunderbirds members must either have a military ID or a special base pass issued by Kirtland Air Force Base (KAFB) in order to enter the base. If you need a special base pass, you must obtain a KAFB Pass Request form and fill it in. The forms are available from the Membership Chair, Pete Havey. Pete typically attends the monthly meetings, or you can contact him via email (Membership). Pete is the single point of contact for base passes. Do Not Fill in any information on the back of the form. Return the completed form to the Membership Chair, Pete Havey; he will review that the form is complete, and he will hand carry it to the Pass and Registration office on KAFB for processing. Your badge will be ready for pickup 2 weeks after you get the form to Pete Havey. NOTE: If Pete cannot get the MVC verification process completed in a timely manner, he will call you and let you know the day he submits your badge to the Pass and Registration Office. That begins your 2 week period for processing. The Department of Defense (DOD), Defense Biometric Identification System (DBIDS) access badge must be renewed every year (this includes all spouses who are Coronado Thunderbird members, even if they no longer drive). Please contact Pete, Membership, if you have any questions completing the form. NOTE: KAFB access badges are the property of KAFB. 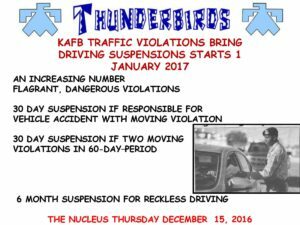 Should you no longer continue your membership with the Coronado Thunderbirds, the badges should be returned to the Membership Chair.